We’re disciplemakers in our homes, in the church office, or at any kind of church event. We’re making disciples from the pulpit, in the classroom, and in one-on-one counsel or consultations. We disciple as we communicate with and oversee a ministry team or staff. All of our relationships involve opportunity for us, as shepherds of God’s flock, to be examples of what it means to follow Him (1 Pet. 5:2-3) but also to verbally point people to the Lord and communicate with them about what it means to be His disciples. If we allow our communication to be governed by the Great Commission, we’ll see that in addition to our authority being in the Lord, the focus of communication also needs to be on Him. 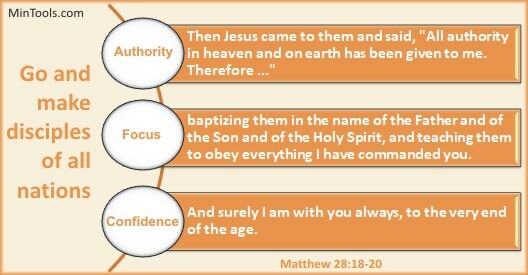 Matthew 28:19-20 provides two ways we encourage disciples to keep the focus on the Lord — baptizing and teaching them. When we baptize people in the name of the Father, Son, and Holy Spirit, we’re giving them opportunity to publicly identify with the Lord, to visually demonstrate having died to sin and becoming alive again in Him. — This is about their allegiance belonging to the Lord. When we teach people to obey everything Jesus commands us to do, we’re helping them align their lives with who He is, so their lives shine for Him and God is glorified. — This is about their accountability being to the Lord. Making disciples must be about keeping the focus on the Lord, not us as leaders. Their allegiance and accountability ultimately belong to the One with all authority (Matt. 28:18), not us. If we don’t keep turning the focus of our conversations, whether formal or informal, in a group or one-on-one, toward the Lord, our communication will fail to produce fully-devoted followers of Jesus. Instruction and guidance must be more than personal opinions or secular counsel. — We make disciples as we look together at God’s Word to see what He says. Conversations and consultations must get beyond merely talking about our situations. — We make disciples as we lead the way in turning to God in prayer. Helping people work through goals for change and growth must be more than a humanistic effort to be good people. — We make disciples as we help them trust God to work in and through them. Our objective in communicating with people shouldn’t be to pull them toward us as leaders, so they think good about us, but rather to point them to the Lord, putting the focus on Him, so they learn to revere and trust Him.